A lot of schools talk about locking down their home state or area. Bowie State has done it again in the D, especially the M, and even the V.
When looking at Bowie State football’s tweets for National Signing Day commits, you’ll see a common factor. Each one enclosed with #HomeGrown. The intentional hashtag envelopes the culture of recruiting at Bowie State. For years, the Bulldogs have taken pride in pursuing nearby schools and athletes in the tri-state area of D.C, Maryland and Virginia (DMV). BSU’s commitment to home successfully continued on Wednesday. Out of the 19 announced commits on Wednesday, 16 are in-state talent covering six different parts of Maryland. Seven of Wednesday’s in-state talent hail from PG County, Bowie State’s home. Suitland High School wide receiver Christian Gray is 5’9″ and 165 pounds and wrapped up his senior year averaging 27.8 all-purpose yards per game. Allen Omerhodzic is a 6’0″, 190-pound kicker from Bowie high school, making 13 of his 15 attempts in 2018. Defensive lineman James Ballanger is 6’2″ and 290 pounds from Elanor Roosevelt High School with 48 total tackles senior year, 45 solo. Then there is Rodney Patterson of National Christian Academy, a 5’9,” 165-pound defensive back and ball-hawk plotting for the ball. Three commits represent Charles Herbert Flowers High School. Neko Boyd is a 6’1″, 215-pound half back coming in averaging 16.7 receiving yards per game at receiver. Offensive lineman Calil Brown stands at 6’4″ and 255 pounds and is a running wall for defenses. 5’11”, 190-pound Safety Mekhi Williams finished his senior year as one of the best in the state of Maryland with 27 total tackles, 18 of them solo. Charm City, BSU’s original home, is a known talent breeding ground for the Bulldogs. Three of Wednesday’s commits come from Baltimore. Defensive back Keith Williams is 5’10” and 180 pounds from Mergenthaler Vocational-Technical and will make sure you go down upon first contact. Milford Mill Academy has two commits. Desmond Shell is a running back at 5’8″ and 172 pounds and finished his senior year with 10 rushing touchdowns. Line backer Kevin Neal is 6’1, 225 pounds and closed out his senior year with 104 total tackles. Three commits hail from schools out of Montgomery county, a closely neighboring county to PG. -Paint Branch High School’s Jordan Griffin is a tight end standing at 6’5″, 240 pounds and averaged 13.3 yards-per-catch senior year. – Curtis Walker is a 6’0″, 215-pound line backer from Our Lady Good Counsel high school and makes sure nothing and nobody advances past him. – Defensive end Kevon Carter-Hackey is 6’2,” 215 pounds out of Quince Orchard High school and toted a 61-yard pick six in his senior year 4A State Football Championship. These three counties surround the south, southeast, and eastern borders of PG County. Each county has one respective representing commit. – Williams is a 5’10, 170-pound defensive back out of Westlake High school in Charles County. Williams recorded six interceptions and a forced fumble in his senior year. – Defensive lineman Joe Murray comes out of Huntingtown high school in Calvert county. At 6’3″ and 215 pounds, Murray deflected five passes and averaged 7.5 tackles a game. – Darius Wilson is a 6’3″ 300-pound offensive lineman representing Meade high school in Anne Arundel County. Wilson received six total offers including one from Alderson-Broaddus, whom Bowie will host in late September and face for a second consecutive year. Through all the love for Maryland, you can’t forget the nearby Nation’s Capital: Washington, D.C. Friendship Collegiate Academy’s Hasan Mosley was DC’s sole representative. Mosley is 5’11”,170-pound defensive back. In August 2018, he set a school record for Friendship Collegiate with an 109-yard game-winning pick-six. Going down to the 757, one commit represents the “V” in “DMV” for the Bulldogs. Tyshawn Blow is a 6’4″, 265-pound defensive lineman. He comes out of Deep Creek high school in Chesapeake, Virginia. Hall wrapped up his senior year with 14 sacks, top-10 in the Hampton roads (a Virginia metropolitan) area. The remaining commit is mid-year signee Chauncey Jackson, a 6’0″, 215-pound linebacker out of Hartnell Junior College in California. Hartnell is from Baltimore and attended high school at Dunbar. The Bulldogs are coming off their best season in school history in 2018 with a locally star-riddled roster. Hometown hero and recent alumnus Amir Hall graduated in three years (education comes first!) and collected two CIAA records, a conference championship and an invitation to the NFLPA Collegiate Bowl on his way out the door. 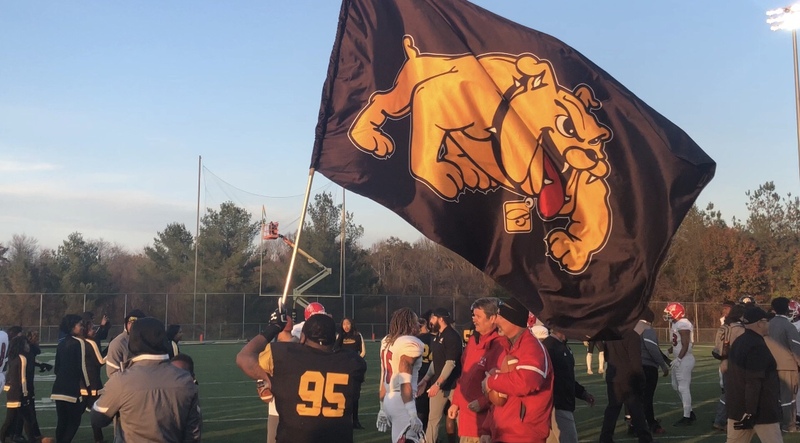 After seeing such team and individual successes, Bowie State is hoping it can continue to be a showcase for local talent.